Summer holidays always remind me of visiting sweet shops in the places we visited, having pocket money to spend and the seemingly endless colorful choice of sweets on which to spend it. My favorite sweets were always the ones that contained sherbet, or kali as it is known in Yorkshire. I loved the bright colors of the sherbet in the jars, the licorice sticks or lollipops which I used to dip into the packets or the flying saucers -- rice paper discs with sherbet inside that melted on your tongue and then gave a fizzy hit. 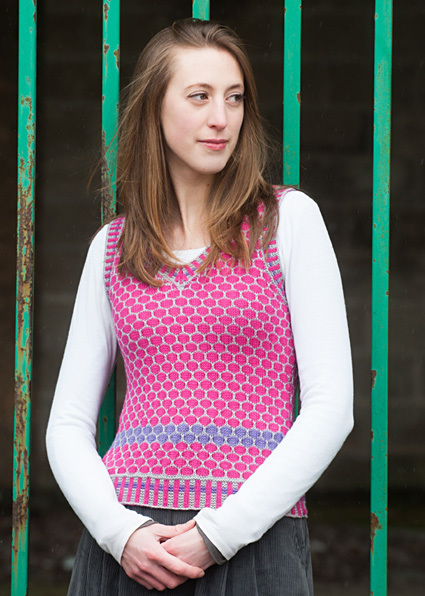 This vest top was inspired by many summer holidays spent in those sweet shops eating sherbet. The bright colors and combinations that it can be made in are endless and the slipstitch pattern reminds me of the flying saucers that I used to love. 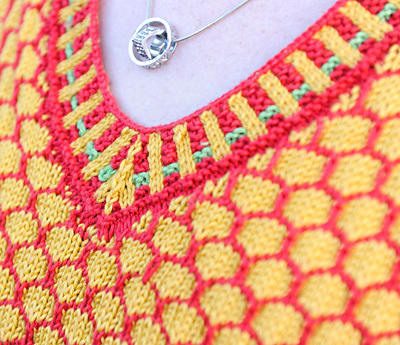 This shape of this garment is perfect for a spring/summer top. It can be layered over a t-shirt or longer sleeve top on those cooler days or worn on its own as a vest top. 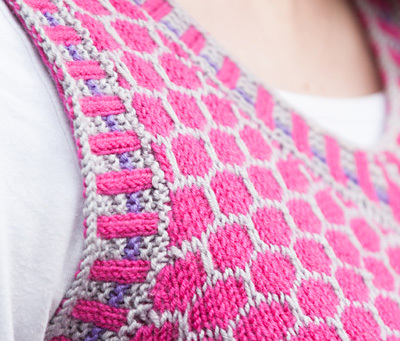 The garter stitch rib adds a pretty detail to all the edges and the splash of a third color makes it zing! 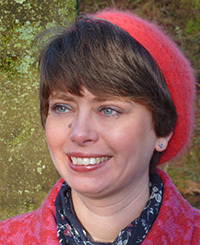 It is surprisingly easy to knit as the pattern is formed with slipstitches, which is perfect for knitting on holiday or after eating too many sweets. Pattern is written to fit with 2 inches of negative ease. A Mattress stitch tutorial can be found here. Using smaller needles and MC, cast on 109[121, 139, 157, 169, 187, 199] sts. Rib Row 1 [RS]: *With CC1 k2, with MC k2; rep from * until 1 st from end, with CC1 K1. Rib Row 2 [WS]: With CC1 p1, *with MC k2, with CC1 p2; rep from * to end. Rep Rib Rows 1-2 five more times. Rib Row 3: *With CC2 k2, with MC k2; rep from * until 1 st from end, with CC2 k1. Rib Row 4: With CC2 p1, *with MC k2, with CC2 p2; rep from * to end. Rep Rib Rows 3-4 once. Work Rib Rows 1-2 three times. Change to larger needles and with MC only, k 2 rows. Row 1 [RS]: With MC, k to end. Row 2 [WS]: With MC, *P1, slip 5; rep from * to 1 st before end, p1. Row 3: With CC1, *slip 1, k5; rep from * to 1 st before end, slip 1. Row 4: With CC1, *Slip 1, p 5; rep from * to 1 st before end, slip 1. Rows 5-6: Rep Rows 3-4. Row 7: With MC, k to end. Row 8: With MC, *slip 3, p1, slip 2; rep from * to 1 st before end, slip 1. Row 9: With CC1, *k3, slip 1, k2; rep from * to 1 st before end, k1. Row 10: With CC1, *P3, slip 1, p2; rep from * to 1 st before end, k1. Rows 11-12: Rep Rows 9-10. Rows 1-12 form the pattern. The pattern is worked as above throughout the body, except for the 3rd repeat where CC1 is replaced by yarn CC2 for one repeat, then changed back to the original colors. Rep the last 4 rows 7 more times. 93[105, 123, 141, 153, 171, 183] sts. Work in pattern until back measures 8 inches from cast on, finishing with a WS row. Rep the last 4 rows 7 more times. 109[121, 139, 157, 169, 187, 199] st are obtained. 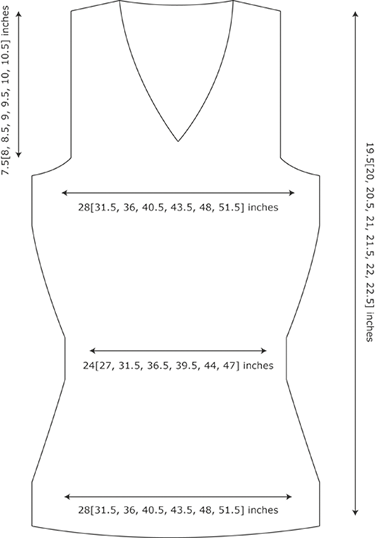 Armhole Shaping Row [RS]: Work 1 st in patt, ssk, work to last 3 sts, k2tog, work 1 st in patt. 2 sts dec'd. Rep Armhole Shaping Row every RS row 8 more times. 71[83, 97, 115, 123, 131, 153] sts. Work straight until back measures 18.5[19, 19.5, 20, 20.5, 21, 21.5] inches, finishing with a WS row. Shoulder Shaping Row [RS]: Work 1 st in patt, ssk, work to last 3 sts, k2tog, work 1 st in patt. 2 sts dec'd. Rep the last 2 rows 8[8, 9, 8, 8, 9, 9] more times. 53[65, 77, 97, 105, 121, 133] sts. Place the remaining sts on a stitch holder or waste yarn. Work as for BACK up to [^^]. BO 10 [10, 12, 12, 14, 14, 14] sts, work in pattern for 42[48, 55, 64, 68, 77, 83] sts, k2tog. Turn. Place the rem sts onto a stitch holder. Each side of the neck is now worked separately. Next Row [RS]: Work 1 st in patt, ssk, work to last 3 sts, k2tog, work 1 st in patt. 2 sts dec'd. Rep the last 2 rows 8 more times, then work 1 WS row. 24[30, 37, 46, 50, 59, 65] sts. Neck Dec Row [RS]: Work in patt to last 3 sts, k2tog, work 1 st in patt. Work Neck Dec Row every RS row 8 more times, then every 4th row 6 times. 9[15, 22, 31, 35, 44, 50] sts. Work straight until front measures 18.5[19, 19.5, 20, 20.5, 21, 21.5] inches finishing with a WS row. Shoulder Shaping Row [RS]: Work 1 st in patt, ssk, work to end. Rep Shoulder Shaping Row every RS row 7 more times. BO remaining sts on foll RS row. Next row: Place next st [centre st of front] onto stitch marker and leave at front to use with neckline. Rejoin yarn with RS facing, ssk, work in patt to end of row. BO 10 [10, 12, 12, 14, 14, 14] sts, work in pattern to end of row. 42[48, 55, 64, 68, 77, 83] sts. Work 1 WS row even in patt. Rep the last 2 rows 8 more times. 24[30, 37, 46, 50, 59, 65] sts. Neck Dec Row [RS]: Work 1 st in patt, k2tog, work in patt to end. Work straight until front measures 18.5[19, 19.5, 20, 20.5, 21, 21.5] inches, finishing with a RS row. Shoulder Shaping Row [WS]: Work 1 st in patt, p2tog, work to end. Rep Shoulder Shaping Row every WS row 7 more times. BO remaining sts on foll RS row. Mattress stitch Right Shoulders together. With MC and RS facing, beg at Left Back neck, knit 53[65, 77, 97, 105, 121, 133] from back st holder, pick up and knit 58 [62, 66, 70, 74, 78, 82] sts from Left Front, k centre neck st, replacing st marker, pick up and knit 59[63, 67, 71, 75, 79, 83] sts from right front. 171[191, 211, 239, 255, 279, 299] sts. Do not join. Row 2 [RS]: *With MC k2, with CC1 k2; rep from * until 2 sts from marked centre front neck st, with MC k1, with CC1 sl2, k1, psso and replace st marker on resulting st, with MC k1, *with CC1 k2, with MC k2; rep from * until end. Row 3: *With MC k2, with CC1 p2; rep from * until 1 st from marked centre front neck st, with MC k1, with CC1 p1 and replace st marker, with MC k1, *with CC1 p2, with MC k2; rep from * to end. Row 4: *With CC2 k2, with CC1 k2; rep from * until 1 st from marked centre front neck st, with CC1 sl2, k1, psso and replace st marker on resulting st, *with CC1 k2, with CC2 k2; rep from * until end. Row 5: *With CC2 k2, with CC1 p2; rep from * until 4 sts from marked centre front neck st, with CC2 k2, with CC1 p5 and replace st marker on centre st, with CC2 k2, *with CC1 p2, with CC2 k2; rep from * to end. Row 6: *With MC k2, with CC1 k2; rep from * until 2 sts from marked centre front neck st, with CC1 k1, sl2, k1, psso and replace st marker, k1, *with MC k2, with CC1 k2; rep from * until 2 sts from end, with MC k2. Row 7: *With MC k2, with CC1 p2; rep from * until 3 sts from marked centre front neck st, with MC k2, with CC1 p3, replacing st marker on marked st, with MC k2, *with CC1 p2, with MC k2; rep from * to end. Row 8: *With MC k2, with CC1 k2; rep from * until 3 sts from marked centre front neck st, with MC k2, with CC1 - sl2, k1, psso and replace st marker, *with MC k2, with CC1 k2; rep from * until 2 sts from end, with MC k2. Row 9: *With MC k2, with CC1 p2; rep from * until 2 sts from marked centre front neck st, with MC k2, with CC1 p1, replacing st marker on marked st, with MC k2, *with CC1 p2, with MC k2; rep from * to end. Row 10: *With MC k2, with CC1 k2; rep from * until 2 sts from marked centre front neck st, with MC k1, with CC1 sl2, k1, psso and replace st marker, with MC k1, *with CC1 k2, with MC k2; rep from * until end. Row 11: *With MC k2, with CC1 p2; rep from * until 1 st from marked centre front neck st, with MC k1, with CC1 p1, replacing st marker on marked st, with MC k1, *with CC1 p2, with MC k2; rep from * to end. Mattress stitch Left-shoulder seam and ribbing. With MC and RS facing, pick up 156[166, 178, 186, 202, 210, 218] sts evenly around the armhole area. Do not join. Row 2 [RS]: *With MC k2, with CC1 k2; rep from * until 2 sts before end, with MC k2. Row 3: * With MC k2, with CC1 p2; rep from * until 2 sts before end, with MC k2. Row 4: *With CC2 k2, with CC1 k2; rep from * until 2 sts before end, with CC2 k2. Row 5: * With CC2 k2, with CC1 p2; rep from * until 2 sts before end, with CC2 k2. Row 6: *With MC k2, with CC1 k2; rep from * until 2 sts before end, with MC k2. Row 7: * With MC k2, with CC1 p2; rep from * until 2 sts before end, with MC k2. Rows 8-13: Repeat Rows 6-7 three times. Sew both side seams together. 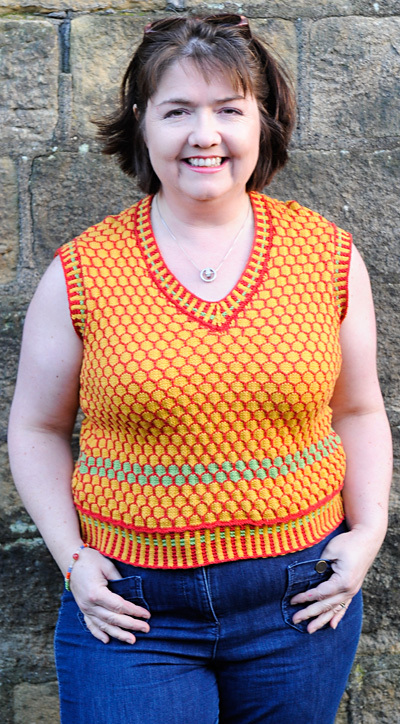 Sarah lives in Yorkshire, England, and loves to add a bit of bright color to her life with her knits to counteract the persistent Yorkshire rain. She can be found on Ravelry.